For everything there is a season, and when it comes to lawn renovation, spring is it. As lawn grasses wake from dormancy, nutrient and water demands increase. Unless you’ve been providing consistent applications of compost or soil improving amendments, chances are your lawn will need some attention now. My five steps to lawn renovation (in this order) are as follows:Lawn renovation focuses on improving existing conditions without killing all existing vegetation. Take this route when you have about 50% lawn coverage or more. Although you will likely have weeds too, by promoting a healthy stand of new grass, you’ll start to choke out and out-compete weeds vying for that same space. 1. Get a soil test. As easy as this is to do, it’s surprising how few people really follow through. Contact your county extension service and tell them you need to do a soil test. They’ll send you all you need to collect the samples and include the box or bag to mail to the lab. What you get back for your modest $10 or so investment is impressive. A report detailing your soil’s nutritional requirements to promote optimal lawn growth will be spelled out. The most common readings noted include your soil’s pH, along with nitrogen, phosphorus and potassium levels. All are important to healthy lawn growth and the report will let you know what is needed in your case specifically to make that happen. Simply follow their instructions and you’re well on your way. Ideally, the best time to amend soil per the report’s suggestions is prior to lawn renovation. But you can’t turn the clock back so take action now. 2. Rake the lawn area firmly to remove excess debris. A dethatching rake or implement pulled behind a mower or lawn tractor works wonders for this. By clearing away dead and dying grass and weed debris, more light, air and water can reach your lawn. 3. Aerate the soil. Rent a core aerator for the day or go in with a neighbor and split the cost. It won’t take long to run this machine over your lawn multiple times. This is a case where more is better. The aerator will extract cores of soil from the ground. The benefit is improved drainage and decreased soil compaction. The open space also improves root expansion and openings for soil amendments and seed to go without washing away. 4. Apply soil amendments and grass seed. Compost is my favorite ingredient to add to my lawn during renovation. Other nutrients you should add will be listed in your soil test report. In the absence of this information, nitrogen is a given that’s always needed. It’s the nutrient that puts the green in grass (non-scientifically speaking of course). The soil test information is helpful here because it tells you exactly how much to add (without adding too much, which is bad on so many levels—including burning). I use Milorganite for this. It’s a non-burning organic nitrogen source that takes the worry out of this. Apply the grass seed per the instructions on the bag. Here, more is not better. Too much seed can lead to overcrowding and eventual overall lawn decline. Alternatively, if you are sodding areas instead, make sure the surface area is clean, and raked smooth of rocks and debris. 5. Water until established. A critical step in this process is proper watering. Although warm temperatures are needed for quick germination and growth, the heat can also be the biggest challenge to full establishment. Keep grass seed moist until germination and sod watered until roots establish. Then water regularly. Proper Watering is being done should be taken care of very perfectly. Also more water and less water is not good for the Lawn. 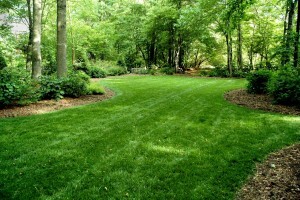 In this article you had clearly described some of the steps that are taken into aspect for the Lawn Renovation. Thanks for the article. !